SOUTHERN CALIFORNIA, from 1770 to 1920, was a land of discovery and immense potential. In those 150 years it developed from a remote and neglected frontier outpost to a Pacific Coast metropolitan center whose cosmopolitan future and growth were clear. The Dawson 80 is a selection of eighty publications that together capture the essence of Southern California during these years of transition. These publications describe the history and culture of the region from a variety of perspectives. To know these eighty books is to know Southern California – its pioneers and people, its booms and busts, its advantages and attractions, and its natural resources and development. 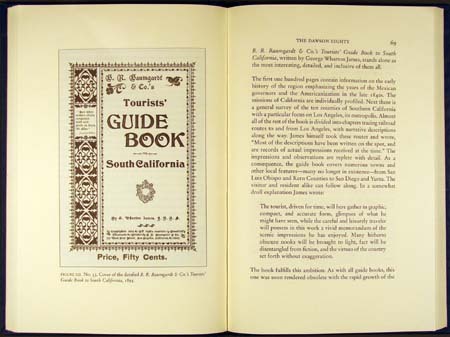 In The Dawson 80, each of these eighty publications is described and reviewed by a member of the Book Collectors of Southern California. Accompanying the narrative are twenty-five illustrations of title pages, covers, and text pages. The book is dedicated to Glen Dawson, who celebrates his ninety-fifth birthday in 2007. In his more than sixty years as a bookman, he has promoted the recognition and collecting of books about and from Southern California. Glen Dawson has long held a deep interest in the Southland and is still an active collector and a distinguished member of the Book Collectors. 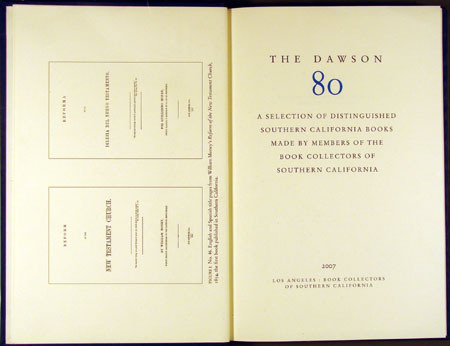 It is an acknowledgment of his life’s work and of the debt of gratitude shared by his fellow members of the Book Collectors of Southern California that this list of the most important publications on Southern California is named The Dawson 80. The book, produced by The Castle Press at Pasadena, California, is printed on 80 pound Mohawk superfine vellum text and bound in blue cloth with a printed dust jacket. The edition is limited to 400 copies and the price per copy is $80.00.